I wanted to point out two excellent resources for explaining some of the macroeconomic issues related to the debt ceiling standoff in Washington at the moment. The red is outlays — or spending — and the blue is revenues. Not a pretty picture. To summarize the piece: For the last several years we have had increased federal spending due to the stimulus package, banking bailout, and Social Security and Medicare payouts. In addition, military costs are up due to post-Sept. 11 wars. 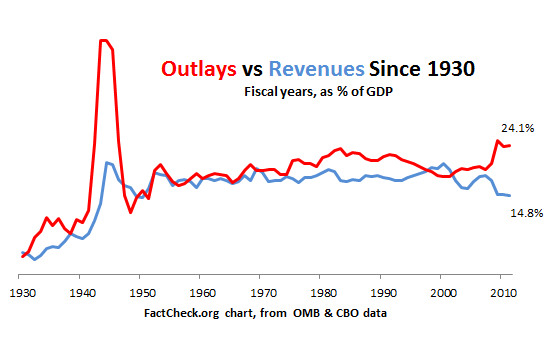 At the same time, federal revenues are down partly due to reduced income tax receipts because of the Bush tax cuts. And the recession has meant less revenue from corporate taxes. Harvard economist Ken Rogoff discusses historical rates of sovereign debt and examines various countries’ GDP to debt ratios. This is a measure of the total value of nations’ economies compared to how much they owe. What do you think this ratio is for three countries in the news of late: Greece, Italy, and the U.S.? Listen to the show to find out. The figures may surprise you.